'Flawed' tells the story of a dystopian society- where once you make a single mistake, you are flawed. You are flawed for the rest of your life. Celestine North is perfect in every way. She has a typically perfect family, everyone likes her, and she has a faultless boyfriend. When something could completely ruin her whole reputation, and her whole life- Celestine has to make a decision. Will she make a stand? Normally, I make a connection with at least a few of the characters from a book, which usually results in everything else coming naturally. I didn't make a connection with Celestine at all this time: I understand that people make mistakes in their lives, but it didn't really feel that the protagonist was learning from her own mistakes, so instead she pushed everyone who was rooting for her away. I felt that the plot was slightly too predictable- with an instant, usual love triangle that wasn't getting me excited for the two characters involved. It also was lacking in something: unfortunately it didn't capture me like I so desperately wanted it to. There were also some graphic scenes that I didn't see coming and I didn't really enjoy- it crossed the line of being vividly descriptive or giving too much detail. 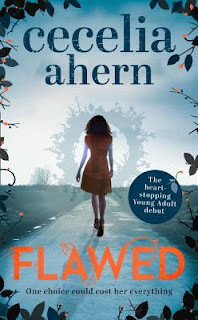 Overall, 'Flawed' is a 3/5- I liked the whole concept of the book, and the pace of the plot was satisfying. The ending started to become more exciting- but the book as a whole didn't really captivate me. But I have seen differing opinions on this book, so I think it depends on people's different tastes.